Canada's Blue Tile Lounge is working on a new video called Four Letter Word. The first teaser is online and filled with lots of slams and a few makes too. For the record, I am totally backing the fiddle music in this teaser. The 3484 video is video is out in Atlanta area shops. 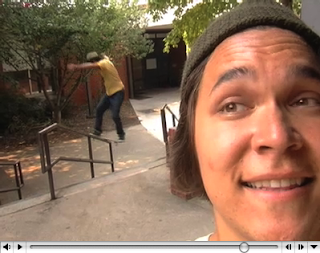 Here is Andrew Edge and Swanny Evans shared part from the video. Nice use of a Belle & Sebastian song guys. Via: Livin' Sick. Whenever Sunday Boardshop puts a video clip out you can expect sick skating as well as a well put together video. Their most recent montage is no exception. The only reason I am linking to this 10 Deep Promo is because it is in HD, and Daniel Kim's tricks are solid. I think the whole street wear thing is stupid. All it is is conspicuous consumption. The London crew has a new montage online. More daylight in this one that the previous Hold Tight London montages. Back in 2005 Post 22 was working on a video called Thrills. It never came out, so James put together an abridged version of what it would have been. Two weeks into the new year and Street Riot brings out their Best of '07 montage. Looks like they had a good year. British board company, Crayon, has a sick little promo online. I feel like the UK is the new East Coast. Rough spots, bad weather and steezy skating. It looks like the city council is in the process of finding a place for a skatepark in Norfolk, but it sounds like they are having trouble finding a place. Read this article for the latest bit of information. The new Post 22 just went online a few minutes ago. New layout, and new video as well as archives of the old montages. We're glad you're back James. In Hollywood they would call this video "high concept," a whole video using Hall & Oats exclusively as the sound track. Weather you like the music or not, the skating is good for a viewing or two. I just came across Null Skateboards via Wooden Cotton. Their video Null & Void is out now. The trailer has some good tricks in it. Dominion has posted Peter Hackett's leftovers form The Main Course. You can always count on, Texas based Therapy Apparel, to come through with a quality clip like this one. Hopefully in 2008 I'll be making more videos. We'll start off with this Gnarly Crew montage hosted by Haveboard. The Gnarly Crew is Neal Wood, Matt Ward, and Mike Beiter. 2008 is off to a good start and is only going to get better because Post 22 is coming back. There is a promo on the site now with a full site coming in a few weeks. The Kiwis at 0nine have a nice edit of Wellington footage. They where in Wellington filming for their new video Skylarking.